Our 35 Hour Live Online Telethon began on Tuesday, October 2nd at 1pm. We surpassed our $15,501 Adoption Goal shortly before Midnight on Wednesday, October 2nd. Here are the archived videos from the Telethon. You may also purchase Exclusive Raising Arrows t-shirts/hoodies/Under Armour apparel. 1 PM EST - The Telethon Begins! Every hour on the hour, I am going to stop in the middle of whatever I’m doing with a live update at Facebook.com/HighFiveJon and again at Instagram.com/HighFiveJon. but darn it, I am committed to doing whatever it takes to get this little online telethon out there so we can bring Baby Alysia home in this crazy, unexpected adoption God plopped into our laps. Here’s the Facebook Live Video that explains WHY and my heart behind this. Thank you for giving to GoFundMe and sharing this telethon on your social media platforms! Any gift in any amount shared at GoFundMe.com/TeamHerron is deeply appreciated and will go directly to the adoption costs. I don’t know if this is a brilliant idea or a dumb idea, but I’ve seen other online donation drives include little incentives or perks for certain dollar amounts. $10,000 Donation - Everything above PLUS I (Jon) will shave your initials into my beard before I preach this Sunday. Tune in on Facebook or Instagram every hour for a live telethon update! Fistbumps + What Does a Pastor Do on a Regular Work Day? I am continuing to go LIVE every hour on the hour at Facebook.com/HighFiveJon and, as I can, over at Instagram.com/HighFiveJon. Our 6pm Hour included an inspiring acapella song from RODERICK PRITCHETT! THANK YOU for sharing on social media and helping make a miracle happen!! I am going LIVE every hour on the hour until Midnight Wednesday -- Desperate Fathers will do CRAZY things for their children!!! AMAZING Update on How Much We’ve Raised Together Since 1pm Today - THANK YOU! THANK YOU for being part of our Adoption Telethon at GoFundMe.com/TeamHerron! Since we began at 1pm today, you have helped us raise $4450!!! We only need to raise $6,951.10 by MIDNIGHT Wednesday! Telethon continues every hour on the hour again on Wednesday starting at 8am - Midnight! We Have to Raise $7,405.56 by Midnight TONIGHT! * * If somebody can get Chris Pratt to tweet a link for GoFundMe.com/TeamHerron, we have a SUPER COOL Jurassic World thing we're gonna do on the Adoption Telethon today! WNEM TV 5 News is Here! THANK YOU WNEMTV5news for coming out to do a news story on our Telethon -- Tune In TONIGHT! Share / TAG / Let's MAKE SOME NOISE! I'm personally proud of the 1pm LIVE Adoption TELETHON entertainment. We only need to raise $6,704 by Midnight TONIGHT! 50% Off ALL Comedy-Driven Leadership Materials at JonathanHerron.com --- Use Coupon Code BABYGIRL --- All proceeds go to the #UnexpectedAdoption! 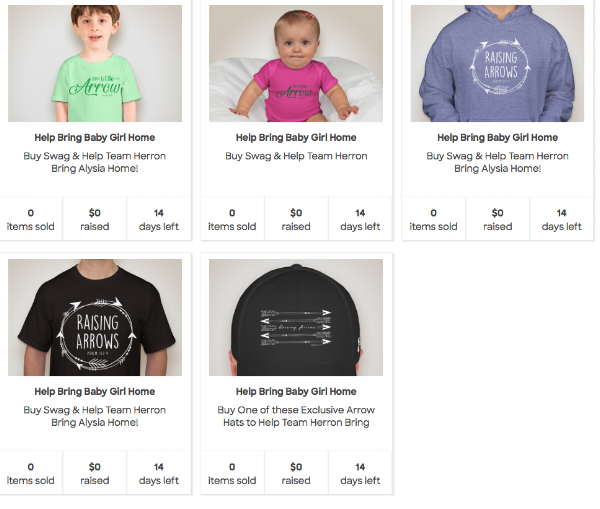 Use Coupon Code BABYGIRL --- All proceeds go to the #UnexpectedAdoption! 50% Off Comedy-Driven Leadership Materials at http://JonathanHerron.com Use Coupon Code BABYGIRL --- All proceeds go to the #UnexpectedAdoption!